Donald Trump has ensured that the silent protests during the national anthem Colin Kaepernick started last year would not vanish into the ether like a career in professional sports. Protest politics is all about generating reactions, and this president always rises to the bait. Displaying his propensity to dangle something stupid and shiny when things are going badly for him, Trump deployed his anger at black athletes with political opinions at a campaign rally in Alabama. In the context of an Iranian missile test, the ongoing development of nuclear weapons in North Korea, and the slow- motion unraveling of a Republican effort to end health coverage for millions of Americans, the anthem protests were an attractive distraction. Conservative white Republicans at the rally cheered. And Trump’s opponents rose to the bait as well. Professional athletes engaged the Twitter war Trump started (the president’s preferred turf for battle–and not just in football. Trump disinvited the champion Golden State Warriors from a White House visit when star Stephen Curry announced that he wouldn’t attend. Curry announced that such pettiness was beneath the office of the president of the United States (score!). Meanwhile, others adopted Kaepernick’s protest, more in support of free speech than a cry against police violence. Stevie Wonder dropped to both knees at a concert. 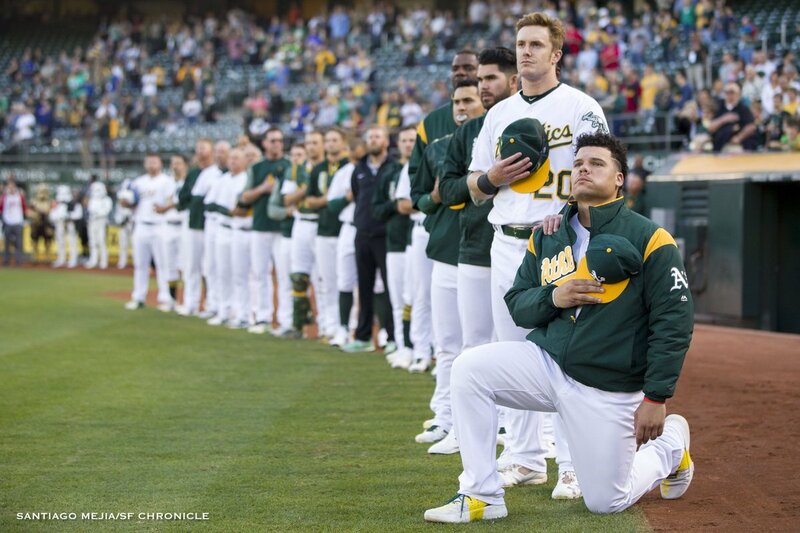 Bruce Maxwell, a rookie catcher for the Oakland Athletics, took a knee during the anthem, supported by both his teammates and the team owner, the first baseball player to join the campaign. Meanwhile, the leaders of the National Basketball Association (NBA) and the National Football League (NFL) announced support of the players, who enjoyed the rights of American citizens to engage in politics. Team owners, many of whom supported Trump or the Republican Party, criticized the president and supported the athletes. The NFL, facing mounting evidence about chronic traumatic encephalopathy (CTE) from repeated concussions, has its own interests in finding distractions and building unity. (Trump, by the way, is appalled by the concerns about brain damage, a position that invites ridicule; write your own joke about how his political prospects depend on it.) Unsurprisingly, the number of athletes kneeling during the anthem increased on NFL Sunday. Even more visibly, athletes who didn’t want to kneel stood, linking arms in solidarity with those who did, including at least one owner, Shahid Khan of the Jacksonville Jaguars. Colin Kaerpernick, whose own story is interesting, remains an engaged philanthropist and an uemployed quarterback. Both fans and analysts think he’s still valuable enough to play professionally. He has paid a price for his commitments. The protests Kaepernick spurred however, about police violence and racial justice, spread slowly through professional sports, continued in his absence from the field, taking on additional meanings as others join. Sometimes, Kaepernick’s sharp concerns were overwhelmed by others inspired by, and copying, his protest. It’s not clear that Trump has made it attractive enough for an owner to bring Colin Kaepernick back to the field. Trump has, however, again provoked his opponents. In the process, the meaning of the anthem protests has changed, from an explicit concern with racism and police violence, to a broader concern with free speech and political debate. And, of course, more vigorous opposition to Trump. This entry was posted in Uncategorized and tagged baseball, basketball, celebrity, Colin Kaepernick, CTE, Donald Trump, football, Jacksonville Jaguars, NBA, NFL, police violence, race, Shahid Khan, Stephen Curry, Stevie Wonder. Bookmark the permalink. He’s always itching for a fight and I think he may have met his match in professional athletes.